Everyone who uses it really freaks out on how responsive and fun it is to work on.. We use it for every thing and prefer to work on this drawing board then a normal standard computer setup .. (We have two iMacs sitting near by)... its a lot more comfortable and easier to work with no mouse.. its great for surfing, working making music and even vid games..
Big Thank you to Bongofish... Bernard and Crew.. 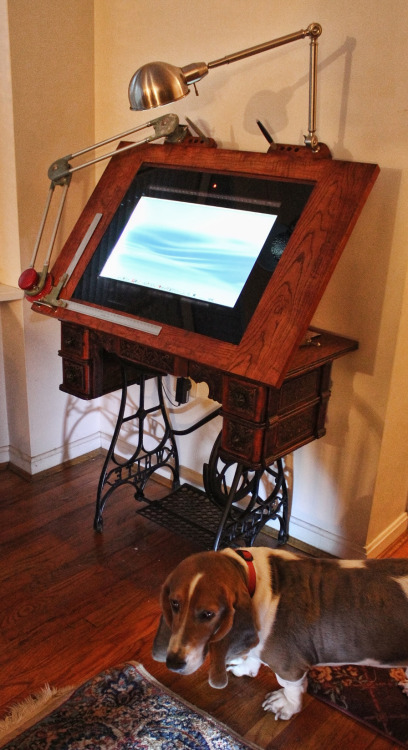 The Wayback Drawing Machine.. version 2.0. This is the first of the 4 new Machines I am building... It is bit more weirder then the rest ..making it stand out a bit.. will have tons of strange stuff.. even pedal power.... I plan more of an industrial look with the others..
Walter is busy working on the machine..
Ready for the magic to happen... installed the Wayback Drawing Machine.. Old Time Keyboard-Trackpad in a hidden drawer.. and a Mac Mini ( Pic below ) plus a hidden sound system.. and a bunch of other fun details.....and yes the pedal powers the light..
Just a basic weird little Mac Mini and keyboard setup will be installed in the drawer.. The building of the unit was so easy , from breaking open the monitor and wacom tablet in less 45 minutes I had the pen calibrated pretty close to go..it testing mode..and working great.. I guess after doing a few its no big deal really.. only tricky part is the LED hook up and cable mod.. and the ISP and better resolution is awesome..
all the wacom presets work also.. These are the other two I have built..still need to stain and assemble..
Also The Portable Wayback Drawing Machine.. Folds up flat for Storage..the third one in build mode.. I have new industrial style designs in progress..they will look too cool..
all will use the same setup..
On my next build I want to have one of my USB typewriters included..Yup..a Digital Typewriter.. Another strange build in the shop.. can type on any screen plus hard copy. As always you have produced some real works of art here, very beautiful indeed! I love the steampunk look of your builds, truly creative stuff and seriously inspiring. Have each of the builds been put together with your original method of shielding? Are they all jitter free? What sort of tape have you used there for the shielding? These are Jitter Free .... No Lag... No Skips and Super responsive.. Nothing except when you get about 3/16 to the sides and it maybe just a pixel or two that you don't even notice. its so close to the edge.. The tape I use is basic 3M foil tape use on duct work.. super sticky.. holds great conforms great.. But I didn't notice it help with the shielding because it was jitter free from the start, But it also is great for the LEDs .. it takes the heat and distributes it.. I also added a piece of alum bar stock and stuck it directly on the LEDS..
Ok heres the crazy part..the Wayback Drawing Machine as you see it complete only cost me 165 bucks total..(excluding the mac mini).. everything ..keyboard.. lights ...Hinges.... drawing machine .. screen and wacom.. ( I was lucky to buy 5 very trashed plastic broken big big wacoms for a buck a piece ) Thats a lot of bang for the buck I think.. Installed a hidden wireless keyboard...just more odd stuff to the odd build...The Drawing Machine its working awesome..and playing with custom brushes ..
What a great place for a keyboard, useful! Jitter is a strange thing...it very strange.. This thing is totally jitter free..until I started testing the new Odd build. A basic USB typewriter all in one computer unit for the robotic Chatbot Monkeys.. Yes Is very strange.. lol...placed it nearby the drawing machine.. and low and behold a one to two pixel jitter..just from the monkey machine.. very strange.. moved it and the jitter is gone..